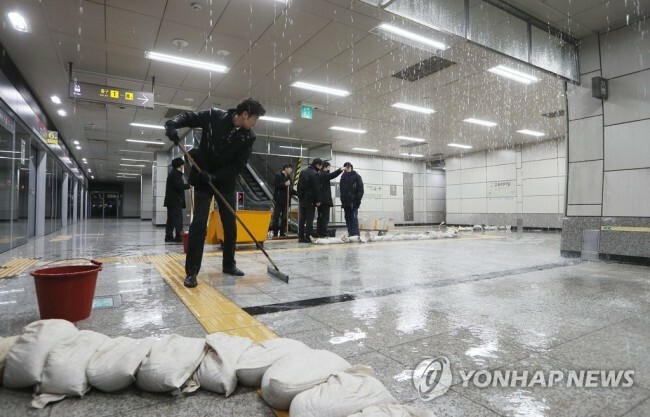 Water was sent gushing into the streets of Gwanghwamun around midnight Sunday, as a water main near Gyeongbokgung Station broke due to record cold weather, according to city local news outlets. Roads around the area were blocked for more than six hours as the water froze, creating icy conditions. Also on Monday, a water pipe burst at around 5:30 a.m. at Express Bus Terminal Station on Line No. 9 in southern Seoul. Water flooded there from the ceiling above one of the subway station entrances, until a crew was able to shut the water off. “We advised passengers to avoid the area while trying to find out the exact cause of the burst. It is highly likely the burst was caused by cold weather,” said one of the crew members looking into the burst.